(Lynn MA) It figured to be a close match. 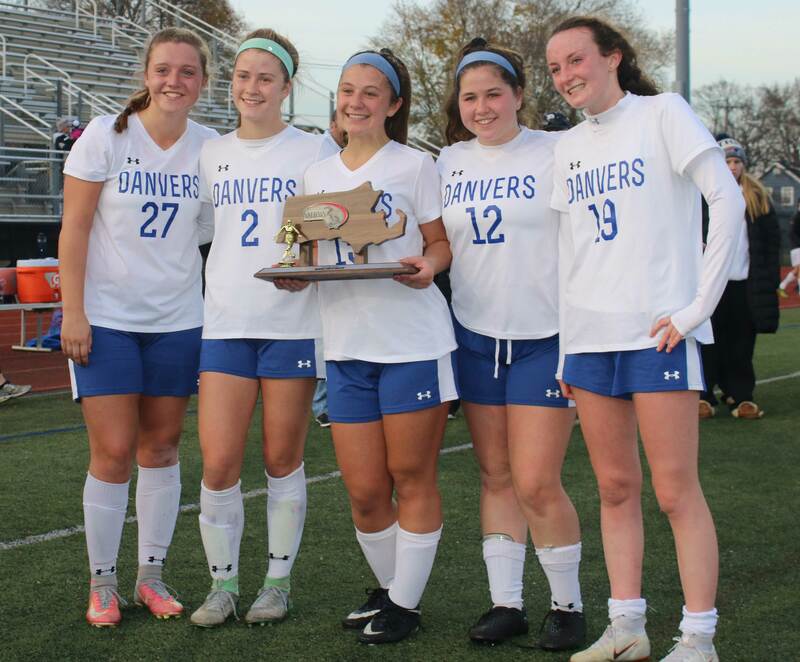 #4 Danvers was the defending D2 state champ while #2 Winchester had lost only once. But it didn’t turn out that way. The Warriors (21-1) jumped on the Falcons (18-3-1) from the get-go with two goals in the first three minutes and another one in the first half. 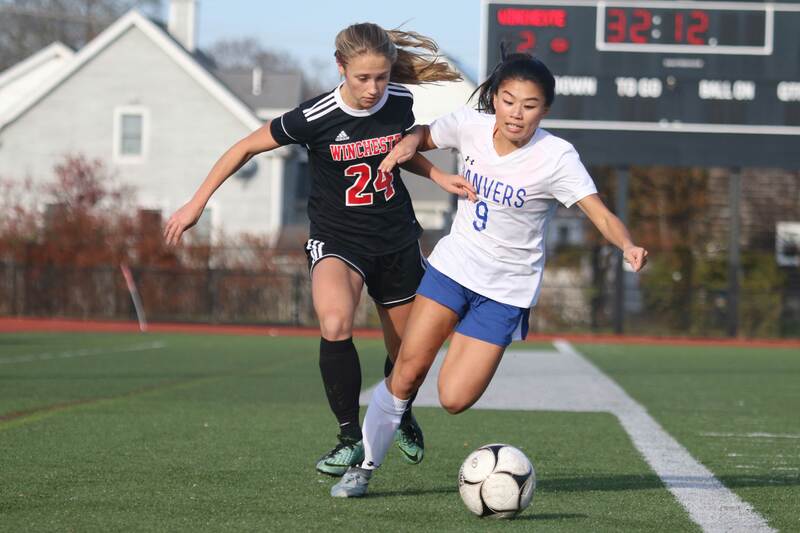 Danvers would get a second-half PK score, but Winchester had separation early and took the D2 North title, 3-1, on Monday afternoon at Manning Field in Lynn. 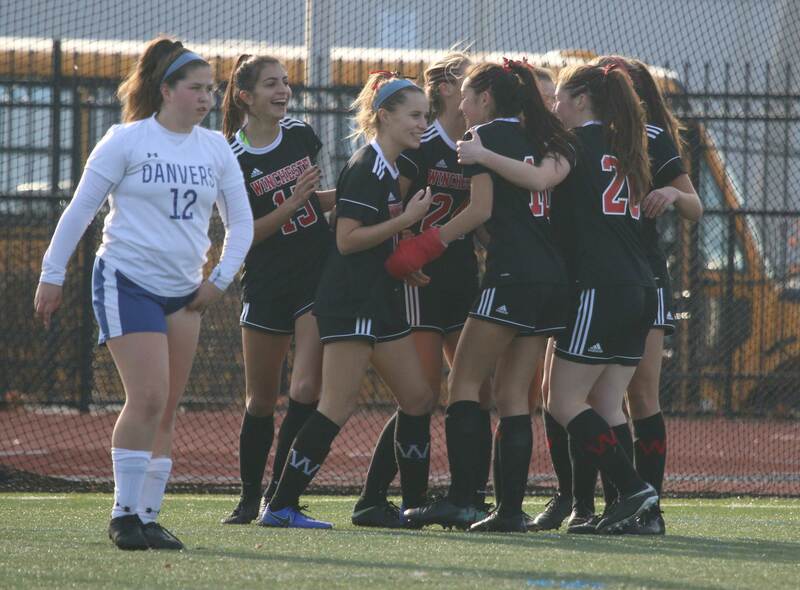 The Warriors will vie for the D2 state title on Saturday (12:30PM) against Hopkinton at Xaverian High School. Winchester poured into the Danvers end on their first possession. 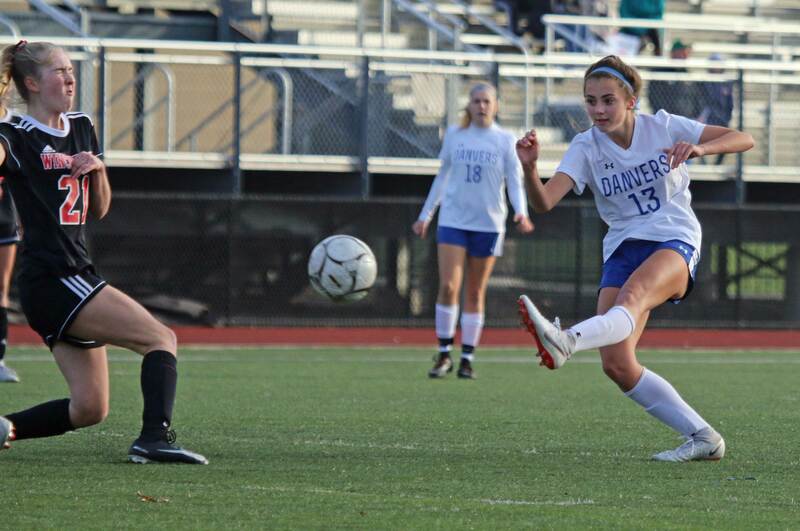 Ella Ross sent sophomore Ally Murphy deep into the Danvers end. 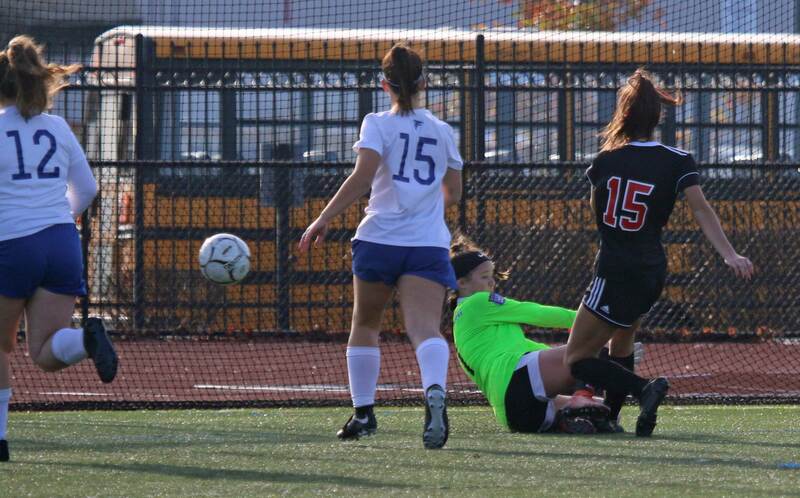 Ally was able to get almost on top of the Danvers GK before releasing a shot past her. That took all of thirty-seven seconds! 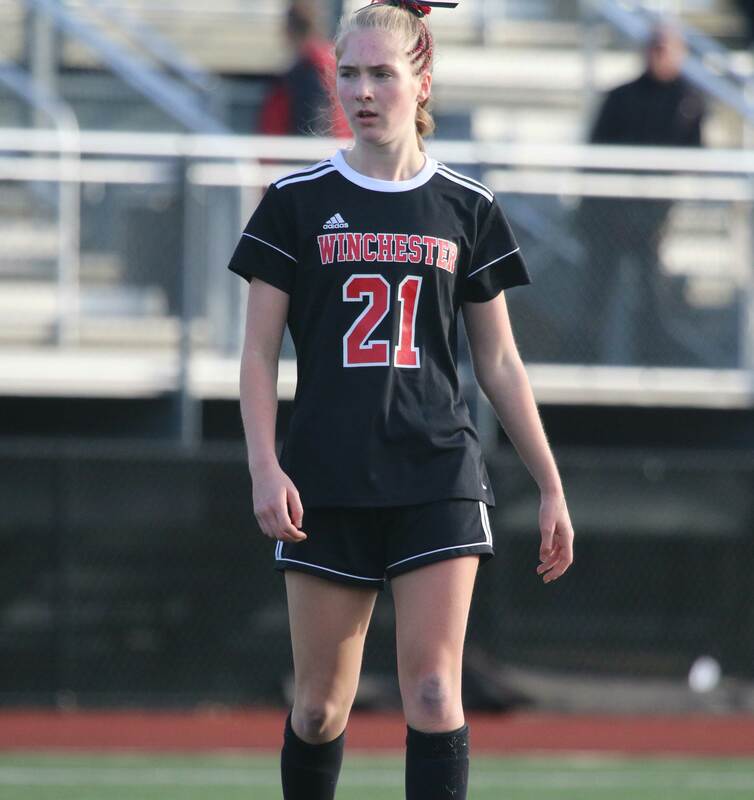 Instead it was Winchester’s Hannah Curtin running the right side, turning the corner and driving in the second goal only ninety-four seconds after the first one. “We definitely weren’t expecting to be able to score that quickly,” said Hannah Curtin afterwards. “We felt that we would have opportunities wide,” said Coach Emanuel. Lauren Clement, Arianna Bezanson, and Madison Capezzuto had shots on net for the Falcons during their attempts to get back into the game. But then the D2 Player-of-the-Year (Hannah Curtin) went to work. 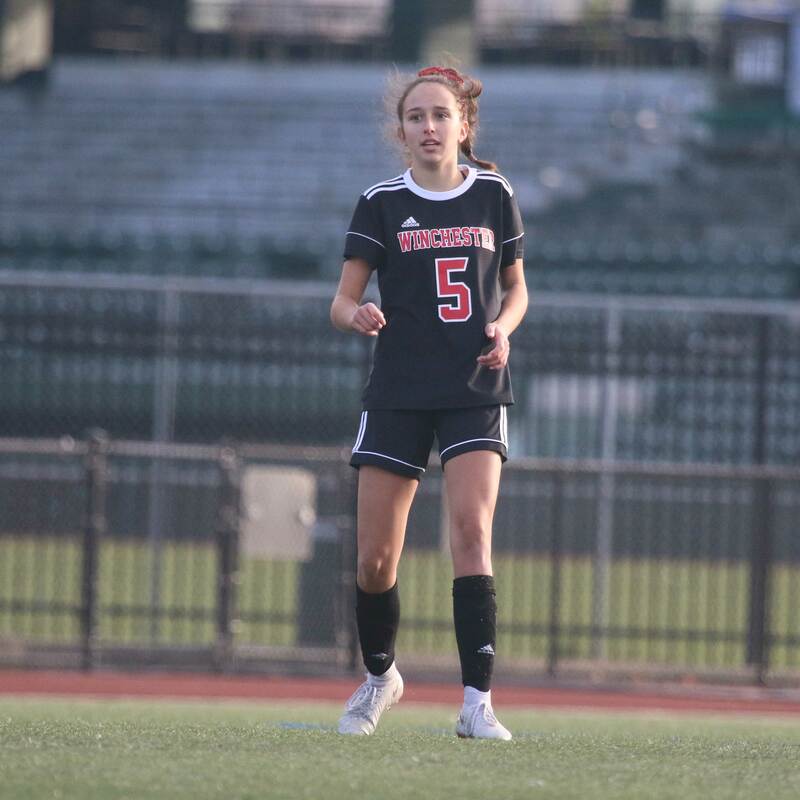 With exceptional speed and dribbling skills, she got past two defenders and drew the attention of other Falcons. 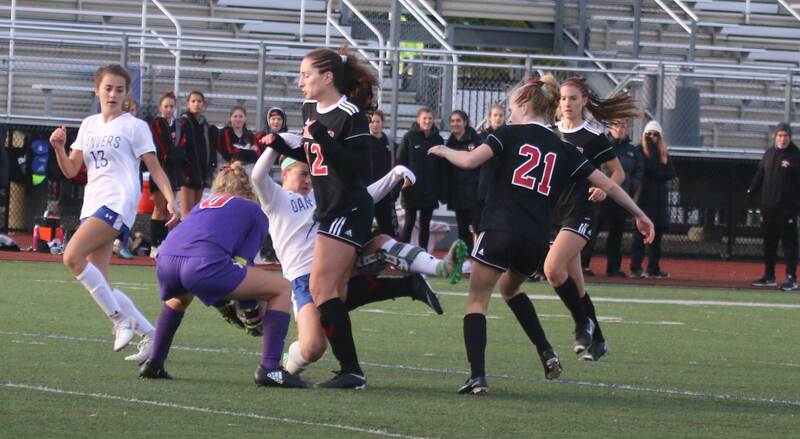 The extra defenders dealing with Hannah left space in the middle unoccupied. That’s when Hannah sent a pass across the goal that teammate Jordan Weinberg was ready for at the far post. The third goal happened at 18:21. The Falcons trailed 3-0 at the half. “We’ve been down before and come back but against a team like Winchester that defends so well, it was a lot to ask,” explained Coach Hinchion. 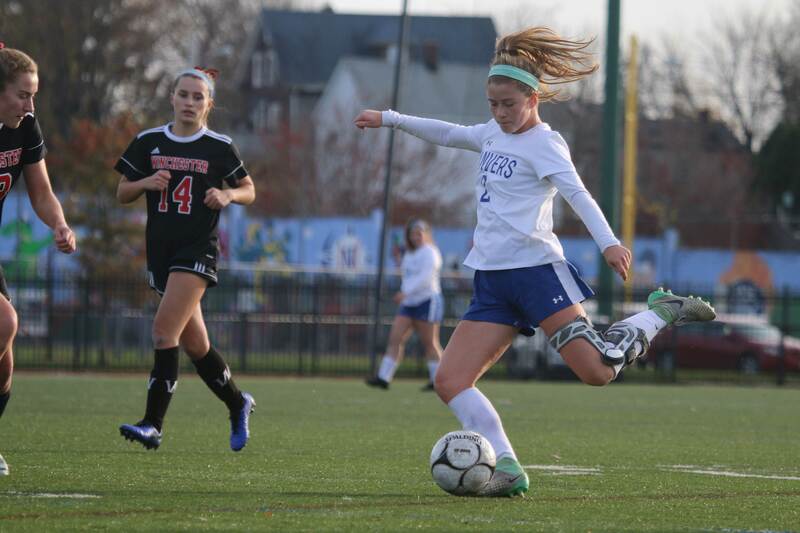 Danvers had several chances early in the second half. On one of them, Riley DiGilio made a nice run down the left side. On another, a corner kick ended up on the ground in the box, but Jessica Pelletier couldn’t get a foot on it. At 22:18 Hannah Markham was whistled for knocking down a Falcon in the box. Riley Baker converted the penalty kick. 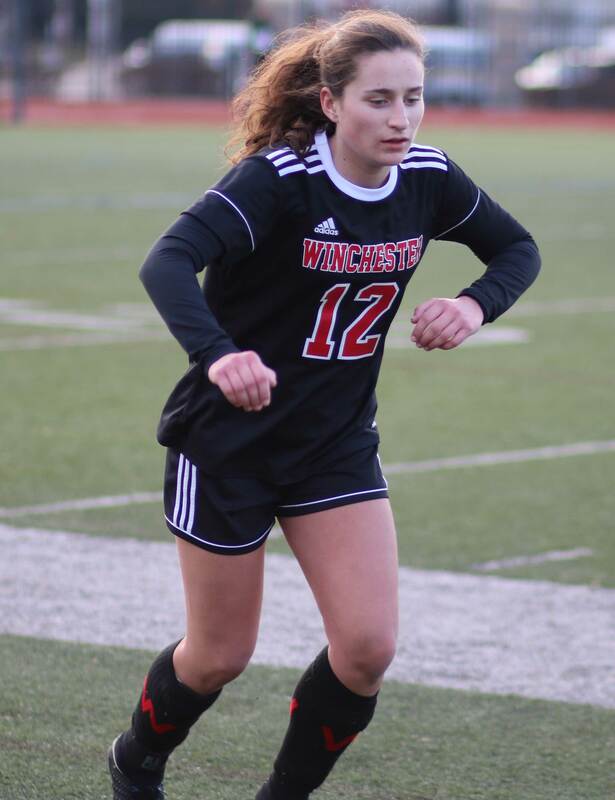 There was time for the Falcons but the Winchester defense, including Hannah Markham, used more long clearances to wear down Danvers and limit their time to attack. 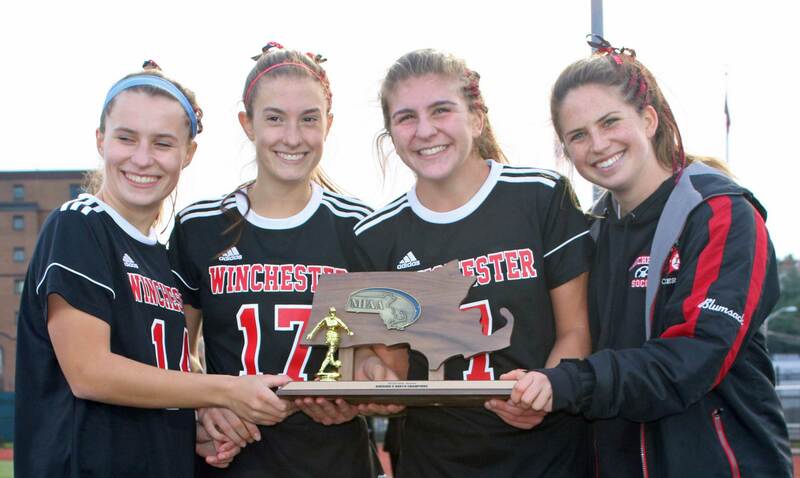 The win by Winchester avenges a 1-0 loss to Danvers in last season’s D2 North title game. “We never really talked about last year,” said Coach Emanuel. 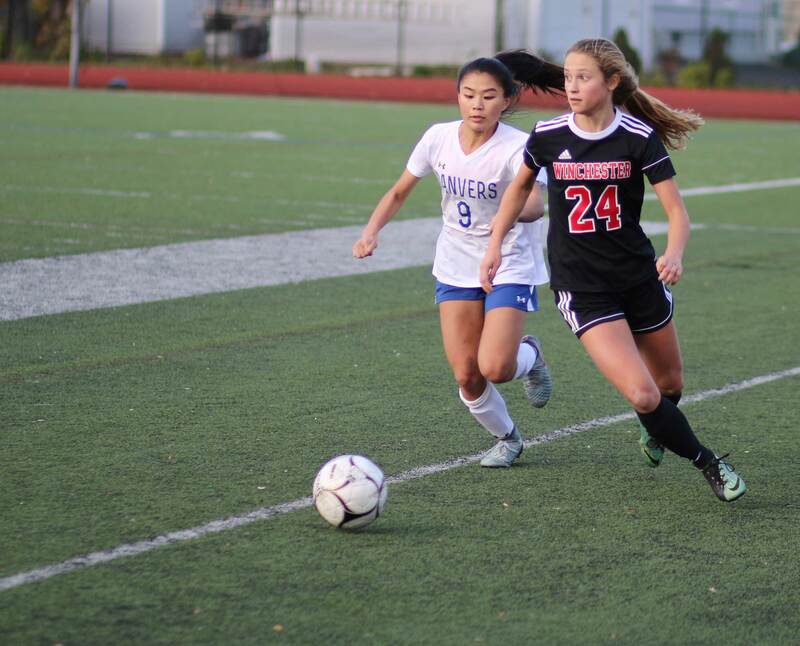 Winchester is from the Middlesex League while Danvers is in the Northeastern Conference. 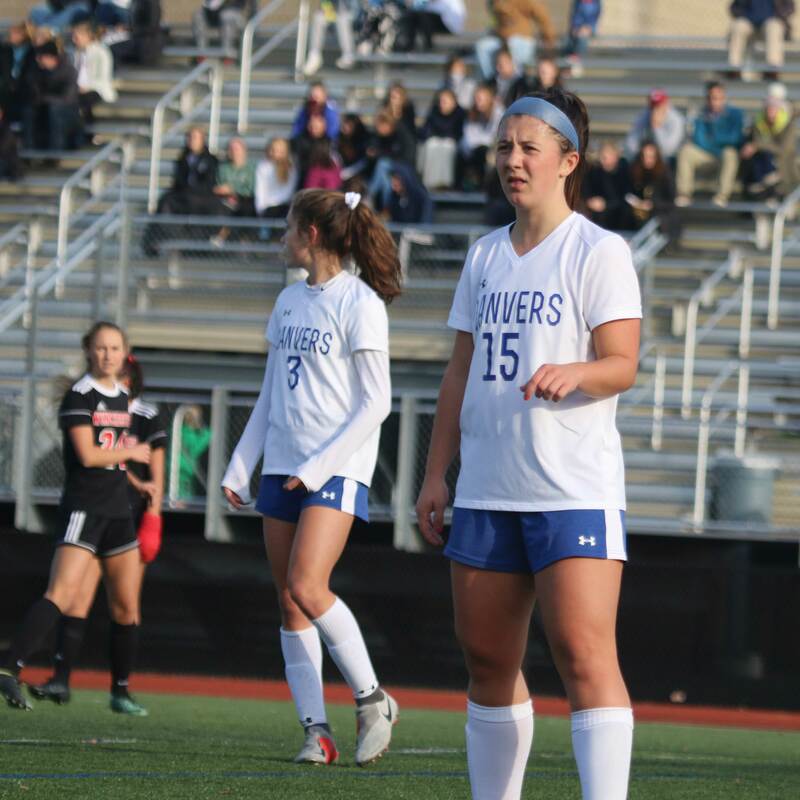 Danvers is 38-5-2 over the last two seasons. Winchester, with one game to play, is 38-3-2. We’re talking about two awfully good programs! 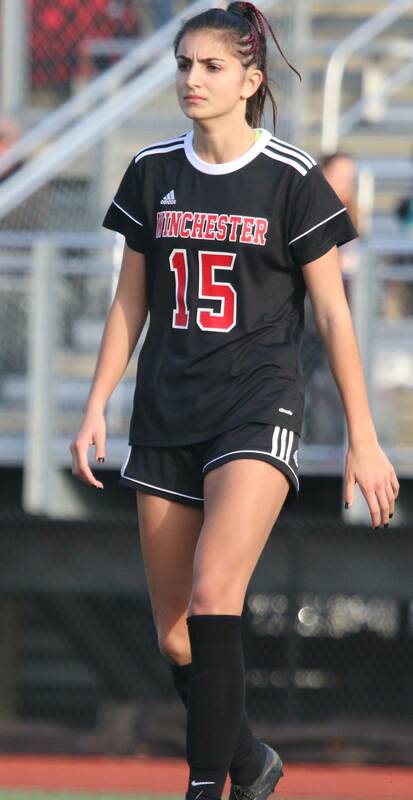 Winchester has now won eighteen straight games. Only loss? Notre Dame of Hingham. I take plenty of soccer pictures hoping to find action and the ball. Usually when players are dribbling, they have their heads down. In this game I caught Hannah dribbling and at the same time looking toward the middle for teammates to pass to. Just a sophomore!